Give your DJ Hero for the PS2, PS3, and 360 a new look with an amazing Carbon Fiber designed skin kit. Our skin kits cover the front of your DJ Hero for the PS2, PS3, and 360. We've design our skin kits with no limitations to provide you with the most protection possible. Our skin kits are digitally engineered to provide cut outs for the most essential areas. 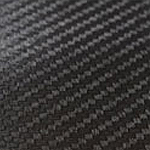 A brilliant, smooth textured metallic finish in a beautiful Carbon Fiber. Rich in depth, clarity, and color with an elegant look that never weakens from any angle or distance. * Please Note * This is a Metallized Polyester Film and is known for leaving a gooey residue when removing if left on for long periods of time. This residue is similar to dried up rubber cement and can be easily cleaned off by rolling it up onto itself like freshly packed snow. This color is only available for gaming devices.